top. A lavishly sized bedroom includes a 7’x7’ walk-in closet with front-loading washer & dryer and private deck. Large, private deeded basement storage as well. Just a short walk to Airport Station on the Blue Line, convenient to restaurants, shops, parks & all that East Boston has to offer! Jamie has lived and worked in the Boston area for over 18 years. She holds a Bachelor of Science in Advertising from Boston University and a Master of Science in Nutrition from Simmons College. Her experience consists of 15+ years..
Live above it all! This gorgeous 2 bedroom, 2 bath penthouse offers panoramic views from atop red hot Eagle Hill! The 2018 renovation created a sunlit open concept floor plan with skyline views complete with full access to your private rooftop, 3 private staircases, a gorgeous kitchen featuring Fantasy Silver Marble countertops, beveled subway tile backsplash, white shaker cabinetry, stainless steel appliances with slide-in gas range & LED recessed lighting. An extra large master bedroom features a walk-in closet with custom closet system & master bath with a gorgeous Carrara marble tiled glass shower complimented by a marble vanity! The second bath is also timeless & rich with Carrara marble shower & vanity. Check the rest of the boxes with a front load washer/dryer, Central Heat & A/C via NEST, pet-friendly fenced yard plus private basement storage! Great location close to the Blue Line, parks, many great restaurants, shops, groceries, water taxis & all that East Boston has to offer! 65 MERIDIAN offers six exclusive condominiums in a newly constructed, five story brick building overlooking Maverick Square, restaurants, cafes and shops. This premier location provides easy access to miles of waterfront amenities, green space and a five-minute commute to downtown. Thoughtful design incorporates elevator access, private decks and oversized South West facing windows with ten-foot ceilings to create beautiful sunlit interiors within each home. Floor plans include spacious one-bedroom flats and duplex three-bedroom penthouses with stellar skyline views from private terraces. Hand-brushed oak flooring, quartz countertops, marble backsplash, marble herringbone and porcelain chevron tiled baths, recessed lighting and Bosch appliances convey urban appeal through timeless materials coupled with contemporary design. 65 MERIDIAN is sophisticated, urban living at its finest. Visit 65meridian.com. 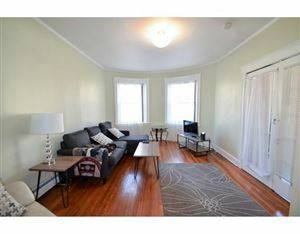 Beautifully renovated 2 bedroom, 2 bath with large private deck in a stately historic Eagle Hill triple decker! This property has been thoughtfully renovated to highlight timeless architectural detail while incorporating modern conveniences! All windows have been restored to their original size & color creating dramatic window lines from the interior & exterior. High ceilings embellished with crown moulding compliment solid oak flooring while Central heat/cool via NEST, in-unit laundry, custom closet systems, recessed lighting, stainless steel appliances, private basement storage & pet-friendly fenced yard check the rest of the boxes. The kitchen is rich with detail from Carrara Caldia quartz to pewter glazed cabinetry & glazed porcelain herringbone backsplash. Two luxurious bathrooms are embellished with marble octagon mosaic flooring, Carrara marble subway tile & hand-finished French grey vanities w/Carrara marble. The master bedroom is 14′ x 13′ not including the master bath and 7′ x 4′ walk-in closet! This property is not for buyers who are looking for cookie cutter condos, bright/trendy colors or vinyl siding! Located near Brooks & Trenton for easy access to the Blue Line, restaurants, shops, parks and all that East Boston has to offer! 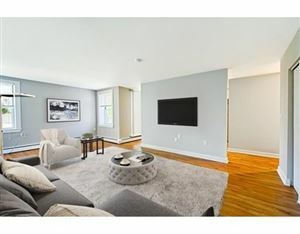 Elegant 2 bedroom, 2 bath w/large private deck located in a handsome triple decker atop Eagle Hill, which has been thoughtfully renovated to highlight timeless architectural detail while incorporating modern conveniences! Windows have been restored to their original size & color creating dramatic window lines from the interior & exterior. High ceilings embellished w/crown moulding compliment solid oak flooring while Central heat/cool via NEST, in-unit laundry, custom closet systems, recessed lighting, stainless steel appliances, private basement storage & pet-friendly fenced yard check the rest of the boxes. Kitchen & baths are rich w/ quartz countertops, herringbone backsplash, marble mosaic flooring & hand-finished French grey vanities. Spacious master bedroom features a sunlit bay window, large master bath & 5’x8’ walk-in closet. This property is not for buyers who are looking for cookie cutter condos, bright/trendy colors or vinyl siding! Located near Trenton & Brooks for easy access to the Blue Line. Now pre-selling six new construction condominiums located two blocks from the Blue Line in an elevator building. Call today to set up a tour! Live at the top of the hill! 2018 renovation combines original detail with timeless modern finishes. This 2 bedroom, 1 bath features soaring 9’6″ ceilings, 2 bay windows, LED recessed lighting, solid hardwood flooring plus a private deck off open concept floor plan, creating an inviting space to entertain. Bonus room for dining or home office! A bright kitchen boasts Fantasy Silver Marble countertops, beveled subway tile backsplash, recessed panel wood cabinetry, stainless steel appliances w/ slide-in gas range. Large master bedroom includes a custom closet system w/additional overhead storage. Upgrade to a modern bath with a Carrara marble vanity, linen closet & front load washer/dryer. Additional amenities include Central Heat & A/C, NEST thermostat, fenced yard & private basement storage. Great location close to the Blue Line, parks, many great restaurants & shops, groceries, water taxis & all that East Boston has to offer! New construction 2 bedroom, 2 bath on a prime Jeffries Point block! Modern design pairs clean lines with walnut & marble finishes creating a unique home just 1.5 blocks from Maverick Square that urbane city dwellers are sure to adore. This spacious floor-through layout includes two generous 18’ bedrooms w/walk-in closets, study/home office, 2 full baths, open concept living room, dining, kitchen w/large island. LED recessed lighting, 9’10” ceilings and 5″ matte walnut flooring run throughout the condo. High-end finishes include Calacatta quartz countertops, 3” marble hexagon backsplash, Brizo & Grohe fixtures, Bosch appliances including slide-in gas range w/vented range hood. Master bath features walnut floating double vanity, Carrara marble herringbone flooring, marble & glass walk-in shower. Rental parking available nearby! Enjoy a private balcony plus common fenced yard for BBQs. Less than a 5 minute stroll to Maverick Station, restaurants, bars, groceries, water taxis, beautiful parks, Harborwalk, kayak launch, sailing center, yacht club, East Boston Shipyard, marina and all that East Boston has to offer! This beautifully renovated 2 bedroom, 2 bath is set high atop Eagle Hill offering stunning skyline views and sunsets from a private deck! 9’5” ceilings, rear bay window in an open concept living room & kitchen w/walk-out deck creates the perfect space to entertain! Bonus room off living room for dining or home office! A bright kitchen boasts Fantasy Silver Marble countertops, beveled subway tile backsplash & stainless steel appliances including slide-in gas range. Large master bedroom features custom closet system with overhead storage, sunlit classic bay window & gorgeous marble tiled master bath with glass shower. Common bath w/Carrara marble vanity top, linen shelving & front load washer/dryer. Check the rest of the boxes with solid oak flooring, LED recessed lighting, Central Heat & A/C, NEST thermostat, fenced yard & private basement storage! Great location close to the Blue Line, parks, many of East Boston’s great restaurants & shops! Sunlit and spacious floor-through three bedroom, one bath in Historic Eagle Hill! This freestanding triple decker boasts original fir hardwood flooring, crown moulding, in-unit laundry, private deck and private basement storage. New and spacious eat-in kitchen features white shaker cabinets, quartz countertops, beveled subway tile backsplash, stainless appliance package including gas range, 27″ front load washer and vented dryer. Large master bedroom with South facing classic bay window. Pet friendly HOA with grassy, enclosed yard. Ideal setup for BBQs and gatherings with yard access from the street and walk-out basement. Less than a half mile walk to Eagle Hill and Day Square restaurants, shops, the East Boston Greenway, Bremen Street Park and Wood Island Station on the Blue Line! Welcome to Eastie! Sunlit three bedroom penthouse with private deck and roof rights overlooking Historic Eagle Hill! This floor through condo includes a private staircase with original mahogany banister & mudroom, fir hardwood flooring, crown moulding, in-unit laundry and private basement storage. New and spacious eat-in kitchen features white shaker cabinets, quartz countertops, beveled subway tile backsplash, stainless appliance package including gas range, 27″ front load washer and vented dryer. Large master bedroom with South facing classic bay window. Pet friendly HOA with grassy, enclosed yard. Ideal setup for BBQs and gatherings with yard access from the street and walk-out basement. Less than a half mile walk to Eagle Hill and Day Square restaurants, shops, the East Boston Greenway, Bremen Street Park and Wood Island Station on the Blue Line! Welcome to Eastie! Newly renovated, 3 bedroom +study, 2 bath featuring 2 private decks plus a private roof deck with panoramic harbor & skyline views! This unique home encompasses the top two levels of a classic Jeffries Point row house on the first block of Webster Street. The first level includes a new kitchen featuring Bosch appliances, slide-in gas range, Pelican White quartz, recess lighting, tile backsplash, breakfast bar, open concept living and dining, full bath w/tub, large bedroom with walk-in closet or study. Exaggerated window trim highlights oversized windows throughout. Second level contains master bedroom w/walk-in closet & full bath, second large bedroom with walkout deck, charming study with access to roof deck. New central heating & cooling system, Bluetooth speaker bath fan, private basement storage in an incredible location just steps to Maverick Sq, restaurants, parks, coffee shops, sailing and all that East Boston has to offer! Renovated floor-through condo with large private deck in a classic Jeffries Point row house on the first block of Webster Street. This open floor plan offers a great layout for entertaining. The bright new kitchen with Bosch appliances features a slide-in gas range, French door refrigerator, Pelican White quartz & recessed lighting. A counter height breakfast bar in the dining area adds additional seating options year round while warmer months can be spent dining on your deck or BBQing in your enclosed yard. Exaggerated window trim highlights oversized windows throughout. A home with this much character wouldn’t be complete without a penny & subway tiled bath. The spacious bedroom includes a closet wall w/custom shelving, lofted storage & Electrolux washer/dryer. New central heating & cooling system, Bluetooth speaker bath fan, private basement storage in an incredible location just steps to Maverick Sq, restaurants, parks, coffee shops, sailing and all that East Boston has to offer! Large, bi-level, 3bedroom condo with 2 off street parking spaces, views of the Tobin, lush green space and roof deck! Note the original Eagle Hill charm that has been maintained through out the property. Extra large kitchen features Ben Moore Sea Salt maple cabinets, Fantasy Brown Marble, subway tile backsplash, recessed lighting, wood flooring, stainless appliance package with gas range & laundry room. Large master bedroom with bow windows, hardwood flooring & walk-in closet. Full bath includes a Duravit soaking tub, subway title surround & marble vanity top. Fenced yard is great for cookouts, gardening or just lounging. Bonus accessory/garden shed & private basement storage. Convenient to the Blue Line, local restaurant, shops, parks, zip car, water taxies, miles of harbor walk and many more of East Boston’s amenities! There is a Hubway Station located on Condor Street and multiple developments in pipeline. Take advantage of this great opportunity to invest the neighborhood! 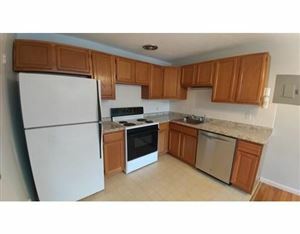 counter tops with full backsplash, white shaker cabinets, Frigidaire Gallery and Samsung stainless appliances. The bath features a crisp, white subway tiled tub, pedestal sink and linen closet. Enjoy summer evenings on the oversized private deck, weekends grilling on the private brick patio and sizable, enclosed common yard! Brand new, full size Maytag washer & dryer plus deeded storage in the basement. A short walk to Airport Station, restaurants, shops, parks & all that East Bostonl has to offer! Exceptional 3 bed, 2 bath on highly sought after Lamson Street. 2017 renovation highlighting a unique floor plan, which allows for floor-through sunlight, efficient use of space & 2 private decks. East Boston has to offer! Exceptional 3 bed, 2 bath located on highly sought after Lamson Street. 2017 complete renovation highlighting a unique floor plan, which allows for floor-through sunlight & efficient use of space. Quartz countertop create a timeless kitchen enhanced by charcoal glass subway backsplash, GE stainless appliance package with slide-in gas range, Electrolux washer/dryer & walk out to enormous 10’x32’ private deck! The master is fully equipped with a 2 person, walk-in shower, quartz vanity top & built-in closet system. Additional features include Central A/C & heat, Navien tankless water heater & professional property management! Walk to Brophy & Piers Park, Bremen St Dog Park, yoga, Maverick Station, Logan Airport, restaurants, water taxis, Hubway and all that East Boston has to offer! all that East Boston has to offer! washer/dryer! Enjoy the warmer months on your private cobblestone patio w/garden. Deeded storage in basement. A short walk to Airport Station, convenient to restaurants, shops, parks & all that East Boston has to offer! & many great existing and upcoming restaurants! Paris Street Pool & the newly renovated Paris Street Gym are located on the same block! Walk Score rates this location 95, a “Walker’s Paradise”. First showings at open houses 11am-1pm Saturday, Nov 12th & Sunday, Nov 13th. 2016 FULL RENOVATION! Sophisticated & efficient one bedroom, one bath in Jeffries Point! This fourth level penthouse offers skyline views, deeded roof rights, an open concept kitchen, dining, living area featuring gorgeous white oak flooring, Fantasy Brown marble countertops, marble subway backsplash, white shaker cabinets, GE stainless appliance package featuring a slide-in gas range & french door EnergyStar refrigerator, recessed lighting & walk out to private deck with views to the East! West facing bedroom lined with three large windows, recessed lighting, white oak flooring & walk in closet, full bath with marble vanity top, deep soaking tub, subway tiled shower and Electrolux washer & dryer. Extremely efficient, multi zone Mitsubishi split heating & cooling system. Short walk to Maverick Station, restaurants, coffee shops, Piers Park, Maverick Sq, CrossFit, water taxis, and all that East Boston has to offer! 2016 COMPLETE RENOVATION! Floor through one bedroom, one bath in Jeffries Point! Open concept kitchen, dining, living area features beautiful white oak flooring, Fantasy Brown marble countertops, marble subway backsplash, white shaker cabinets lined with crown molding, a GE stainless appliance package featuring a slide-in gas range & french door EnergyStar refrigerator, recessed lighting & walk out to private deck! Sunny bedroom with recessed lighting, white oak flooring & walk in closet, full bath with marble vanity top, deep soaking tub, subway tiled shower and Electrolux washer & dryer. Extremely efficient, multi zone Mitsubishi split heating & cooling system. Short walk to Maverick Station, restaurants, coffee shops, Piers Park, Maverick Sq, CrossFit, water taxis, and all that East Boston has to offer! 2016 COMPLETE RENOVATION! Brick, bi-level, 3 bedroom, 1.5 bath in Jeffries Point! The reverse floor plan creates a bright open concept kitchen, dining, living area on the upper level featuring beautiful white oak flooring, Fantasy Brown marble countertops, marble subway backsplash, white shaker cabinets, a GE stainless appliance package featuring a slide-in gas range & french door EnergyStar refrigerator, recessed lighting, walk out to private deck, a half bath & front facing bedroom. The lower level offers two spacious bedrooms with oversized closets, white oak flooring, recessed lighting, a full bath with marble vanity top, deep soaking tub, subway tiled shower & flooring, laundry closet & walk out to your private, enclosed patio/yard! Central heat & A/C. Short walk to Maverick Station, restaurants, coffee shops, Piers Park, Maverick Sq, CrossFit, water taxis, and all that East Boston has to offer! Sunny top floor two bedroom with deeded roof rights! Window-lined open concept dining room & living room create an ideal space for gathering. Spacious kitchen with large laundry closet, stainless appliances, tile backsplash, recessed lighting & abundant cabinet space. Generous master bedroom features an oversized walk-in closet/dressing room, sunshine filled bowed windows, French doors, & hardwood. Second bedroom has hardwood & a large folding door closet with built-ins. An enclosed common patio with lush greenery, a waterfall fishpond, grilling area and ample space for dining tables enhances city living in warm weather months. Construct a roof deck & enjoy city views! Short walk to Orient Heights T Station, restaurants, Constitution Beach. East Boston Residents pay 40¢ tunnel tolls. Take advantage of this opportunity to buy in Orient Heights while there are multiple developments in the pipeline! Presenting this sunny 1 bed 1 bath with a view of the vibrant garden patio featuring a waterfall fishpond! This first floor walk-out offers an open concept layout for easy entertaining whether you’re gathered around the dining room table or grilling near the patio table. Custom features include marble flooring, lighting fixtures, built-in shelving, stainless backsplash and a spacious bathroom with a 2 person Jacuzzi tub, flat screen TV & speakers. Laundry hook-ups are located in the bonus room/storage area. Additional highlights: gas stove, dishwasher, common fenced in yard, storage shed w/ heat & electric, short walk to Orient Heights T Station, restaurants & Constitution Beach. East Boston Residents pay 40¢ tunnel tolls. Taxes about $144.05 with residential tax exemption in place. Take advantage of this opportunity to buy in Orient Heights while there are multiple developments in the pipeline! Stunning luxury smart condo steps to the Blue is the perfect combination of convenience & contemporary design! This bi-level penthouse features 2 bedrooms, 2 baths, roof-deck, skyline view & laundry! Enjoy the floor-through entertainment level: open concept kitchen w/brilliant white quartz countertops, counter seating & Frigidaire stainless appliance package w/gas range, a sun-filled living room, crown moulding, recessed lighting, gleaming hardwood, home office/dining room, full tiled bath w/tub, laundry closet, & walk-out to private roof deck. Bedrooms are located on 2nd level along with a full bath featuring glass stall shower w/oversized subway tile, herringbone marble flooring & floating vanity. Smart home via iPad Air, Sonos audio system & Nest integrated heat & Central A/C. Less than 5 min walk to the T, restaurants/bars. Easy access to I-90 and I-93. East Boston Residents pay 40¢ at tunnel tolls. Off-street parking conveniently available next door for snow emergencies & guests! This stunning luxury smart condo steps to the Blue line is the perfect combination of convenience and contemporary design! The open concept kitchen, dining, living area offers ideal space for entertaining or working from home. A bright & modern kitchen with brilliant white quartz countertops and Frigidaire stainless appliance package with gas range flows seamlessly into the living/dining room via sleek hardwood, recessed lighting and crown moulding. Both bedrooms have spacious closets and are just a few steps from the laundry closet. The gorgeous modern bath contains a glass stall shower with oversized subway tile, herringbone marble tile flooring & floating vanity. Smart home via iPad Air, Sonos audio system & Nest integrated heat & Central A/C. Less than a 5 minute walk to the T, restaurants & bars. Easy access to I-90 and I-93. East Boston Residents pay 40¢ at tunnel tolls. Off-street parking is conveniently available next door for snow emergencies or guests! Floor-through sunlit one bedroom with gleaming hardwood flooring. Spacious open concept dining room and living room are ideal for entertaining. The adjoining kitchen with laundry offers a comfortable breakfast bar, newer stainless appliances, tile backsplash, gas cooking, recessed lighting, wood cabinetry plus a large closet and space for a desk or café table. The bedroom is complete with classic, sun-filled bowed windows, a ceiling fan and hardwood while the bath features tiled glass stall shower and flooring. An enclosed common patio with lush greenery, a waterfall fishpond, grilling area and ample space for dining enhances city living in warm weather months. A short walk to Orient Heights T Station, restaurants & Constitution Beach. East Boston Residents pay 40¢ tunnel tolls. Take advantage of this opportunity to buy in Orient Heights while there are multiple developments in the pipeline!